Concrete is a commonly used material for many different situations, including floors, walls, ceilings and countertops. Concrete is a very strong and durable material that can last for years to come. However, certain circumstances such as foundation settling or large tree root growth can cause the concrete surface to crack. 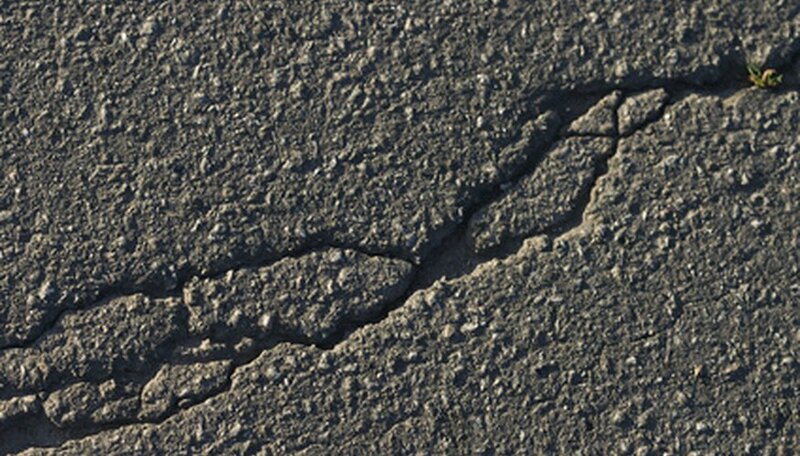 Repairing these large cracks in the concrete takes time and patience, but it can be done. Wear safety goggles over your eyes, and gloves on your hands for protection from flying concrete chips. Hammer the head of the cold chisel into the crack so that the bottom is wider than the surface edges, creating a backward-angled cut. This process is called undercutting, and it helps the concrete patch have a stronger bond and hold. Cold chisels are metal chisels forged for materials such as masonry not softened by heat. Brush the crack out with a stiff-bristled broom to remove all loose particles and concrete chips away from the inside of the crack. Sweep the debris away with a broom and dustpan. Pour concrete bonding adhesive into a small plastic container. Dip a small paintbrush into the bonding adhesive and apply a thin layer to all interior and exterior surface areas of the concrete crack. The bonding adhesive provides a tight seal between the old concrete and the new concrete patch compound. Mix the concrete patch compound in a large bucket according to the stated package instructions. Some manufacturers offer easy, ready-to-use concrete patch compounds that are premixed. Use a pointed trowel to force the concrete patch compound within the crack, filling it up to the top. Smooth the patch compound out with the pointed trowel, and even the mixture to the same level as the surrounding concrete. Allow the repaired crack to harden thoroughly for 24 to 48 hours, undisturbed, or however long as the instructions included with the patch compound state.